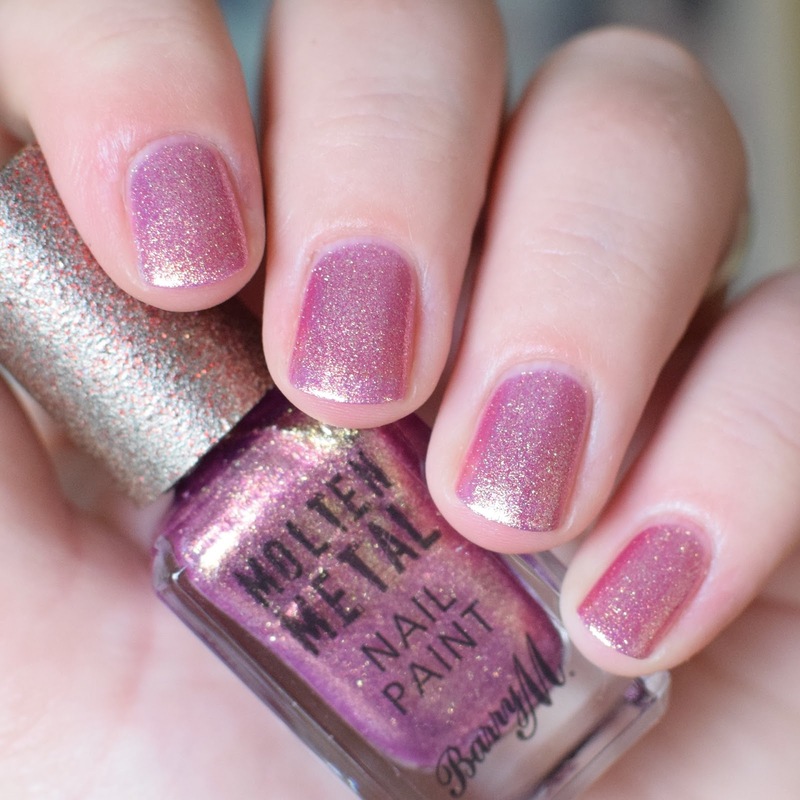 Today I have swatches of Barry M's four latest polishes in the Molten Metal collection. 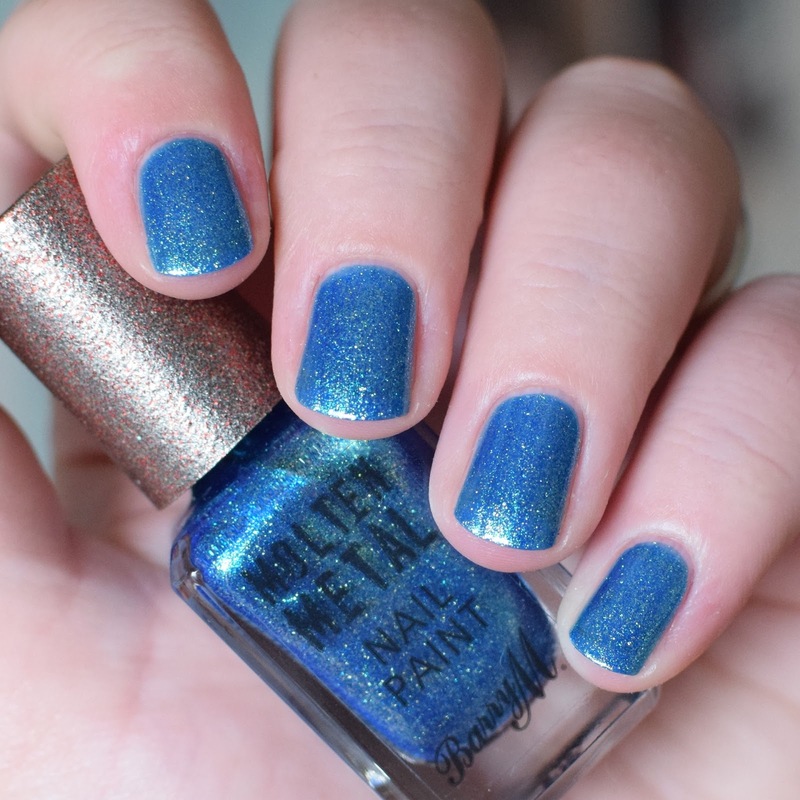 If you've read any of my previous swatch posts for the Molten Metal polishes, you'll know that it's one of my all-time favourite nail polish collections. So I'm always excited when Barry M releases new shades. First is Pink Luxe, the polish has a pink jelly base and is packed full of gold glitter flakes. It is a really pretty shade, that is subtle and elegant - a great spring/summer shades. The lightest colour if the four, the polish would make a beautiful base for nail art designs. I needed three coats of Pink Luxe. It looked opaque in person after just two, but my nail line was really visible in pictures, so I added a third and then it was fully opaque. 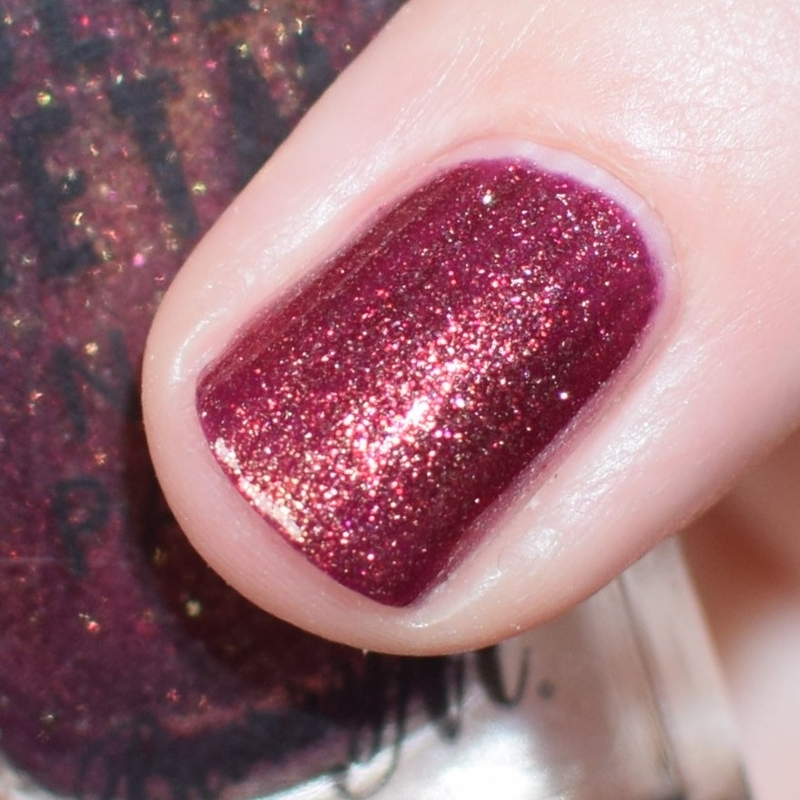 Next is Antique Gold, which has a burgundy/maroon jelly base, full of gold glitter - similar to Pink Luxe. 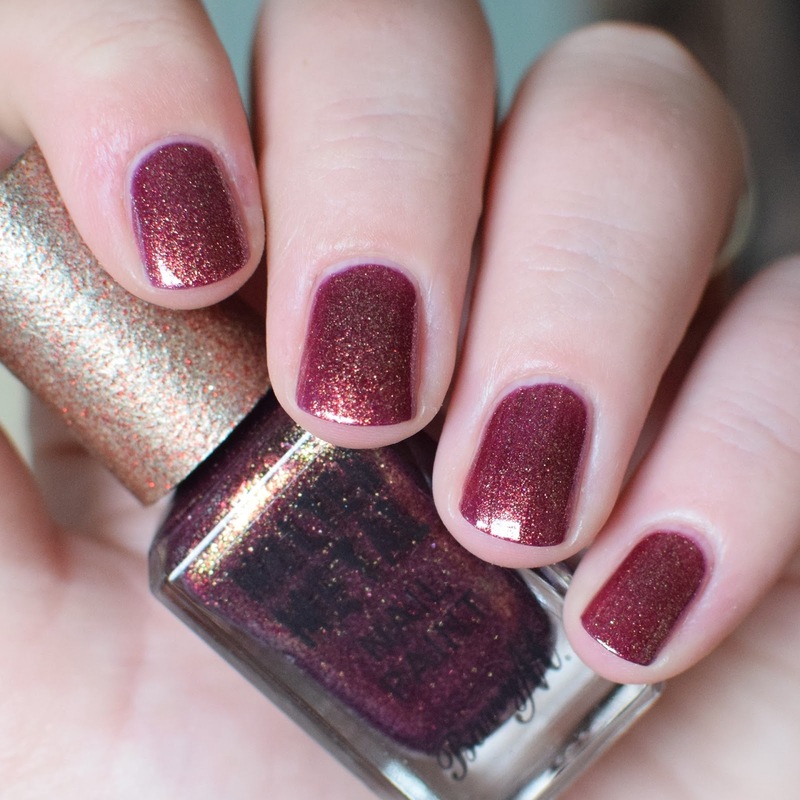 The maroon/burgundy and gold combination makes for a perfect autumn polish shade, perfect this time of year. This, like Pink Luxe, needed three coats for me. But it was mostly me being fussy and you could probably get away with just two coats. The next polish is Crystal Blue, which is my favourite of the four. If you're a regular reader of my blog posts then this won't come as a surprise to you. The polish just screams ocean/mermaid to me. The polish has a bright, vibrant blue jelly base, packed with green and gold glitter flakes. The combination of the base shade and glitter creates a stunning turquoise colour. The polish only needed two coats to be opaque. It's a perfect shade for the summer months and would definitely be a great polish to use for oceany themed designs. The final polish is Celestial Silver, which has a grey/silver base with a purple duochrome effect. It's full of holographic silver flakes and also has slightly larger holo flakes scattered throughout it. The glittery density is less for this polish than the other three, the slightly different formula gives it a glossier finish and makes it the easiest of the three to remove. 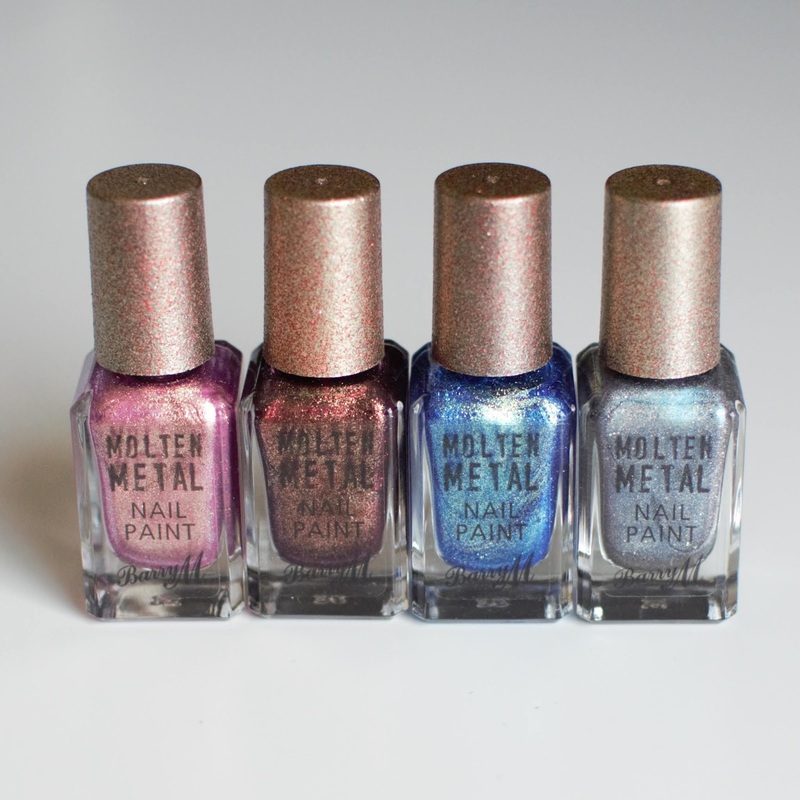 I love all four of these polishes and I think they're great additions to the Molten Metal collection. I think that all four of the polishes are great for any time of year, but I could totally see each of these being best for a different season. As with all of the Molten Metal polishes - and pretty much every glitter polish - they are a bit of a hassle to remove. I recommend a peel-off base coat - my favourite is Barry M's Peel It! Or a strong polish remover, made specifically for glitter polishes - like Essence's Strong & Clean, Extra Power nail polish remover. These polishes each retail for £3.99 from Barry M or at Superdrug. In my opinion, they are definitely worth picking up, especially if you love the Molten Metal polishes like I do. I can't wait to see what shades - if any - Barry M add to this collection in the future.